Xanthomonas axonopodis pv. phaseoli (Smith) Vauterin, et al. It is not always possible to separate the losses caused by common blight and those due to halo blight, Pseudomonas syringae pv. phaseolicola, since they frequently occur together in the same field and even on the same plant. 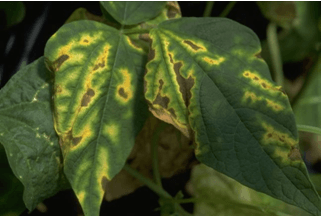 Moreover, the severity of blight varies from year to year depending on weather conditions. In general, Xanthomonas axonopodis pv. phaseoli causes the most severe disease under fairly high temperature conditions (25-35°C), and also requires high rainfall and humidity. Yield losses estimated at 22% and 45% have been obtained by natural and artificial infections, respectively, in Colombia. Economic surveys, based upon field observations in the same region, estimated yield losses of 13%. Induced symptoms on leaves, stems, pods, and seeds: Leaf symptoms initially appear as water-soaked spots which enlarge and frequently coalesce with adjancent lesion. Infected tissues appear flaccid and lesions are often encircled by narrow area of lemon-yellow tissue. Necrosis then develops and may become extensive enough to cause defoliation or stem girdle. Infected seeds are sometimes wrinkled and the hilum may be discoloured. Symptoms are similar to halo-blight of bean. Symptoms on the seed: If the infection occurred when the pods were young, the seed may rot or be wrinkled and shrivelled. If the bacteria enter by way of the funiculus, only the hilum may be discoloured, but this is difficult to detect on dark-seeded varieties. Strains producing the brown pigment (so-called fuscans strains) give more conspicuous seed discoloration. The bacterium enters the leaves via stomata or wounds, and subsequently invades the intercellular spaces, causing a gradual dissolution of the middle lamella. The stem is entered in three ways: via the stomata of the hypocotyl and epicotyl; through the vascular system of the leaf; or from infected cotyledons. The seed is penetrated via the vascular system of the pedicel and funiculus. The micropyle also serves as a point of entry into the seed. Direct penetration of seed has not been observed. The pathogen either remains in the seedcoat or passes to the cotyledons when the seed germinates, resulting in infection of the young plants. The bacterium can remain viable for several years beneath the seedcoat. The disease is severe under conditions of high rainfall and humidity, with maximum development around 28°C. Dissemination in the field occurs in conditions of wind-driven rain, and via insects. Agar plate dilution technique. MXP (Claflin et al, 1987) and YDCA semiselective culture medium and serology with commercial kit. Control methods include: planting disease-free seed, avoiding disease by suitable choice of planting date, crop rotation (an 85% reduction of attack was obtained by alternating bean and maize crops in Romania), sprays and dusts (e.g. with copper compounds or streptomycin), and resistant cultivars (Leakey, 1973). Numerous sources of tolerance have been identified, but breeding is complicated by the fact that different genetic systems control the reactions in pods and leaves (Coyne and Schuster, 1974). Reject the accession and initiate new seed regeneration process in the field. Afanador L, Victoria JI. 1981. Specific of ELSIA to Xanthomonas campestris pv. phaseoli identification. In: Lozano JC. Proccedings of the 5th International Conference on Plant Pathogenic Bacteria at CIAT, Cali, Colombia. Claflin LE, Vidaver AK, Sasser M. 1987. MXP, a semi-selective medium for Xanthomonas campestris pv. phaseoli. Phytopathology 77(5):730-734. EPPO/CABI. 1996. Xanthomonas axonopodis pv. phaseoli. In: Smith IM, McNamara DG, Scott PR, Holderness M, editors. Quarantine pests for Europe. 2nd edition. CAB INTERNATIONAL, Wallingford, UK. OEPP/EPPO Data sheets on quarantine organisms. Prepared by CABI and EPPO for the EU under Contract 90/399003. Frison EA, Bos L, Hamilton RI, Mathur SB, Taylor JD, editors. 1990. FAO/IBPGR Technical Guidelines for the Safe Movement of Legume Germplasm. Food and Agriculture Organization of the United Nations, Rome / International Board for Plant Genetic Resources. International Rules for Seed Testing (ISTA), Bassersdorf, Swizerland. 2007. Dectection of Xanthomonas axonopodis pv. phaseoli var. fuscans on Phaseolus vulgaris. Annex to Chapter 7. Seed Health Testing Methods. Saettler AW, Perry SK. 1972. 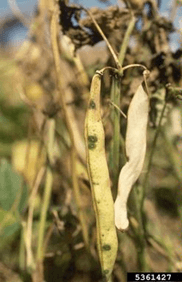 Seed transmitted bacterial diseases in Michigan navy (pea) beans, Phaseolus vulgaris. Plant Dis. Reptr 56:378-381. It is a legume pathogen of worldwide importance. The bacterium has tremendous disease potential. Symptoms first appear as dark, water-soaked leaf spots, up to 3mm in diameter and sometimes surrounded by a broad lemon-coloured halo. 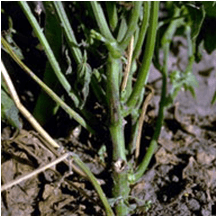 No lesions have been observed on stems or leaf stalks. When these pathogenic bacteria enter the leaves through wounds or natural openings like stomates they multiply rapidly and induce the formation of lesions. The lesions, which are watersoaked at first, soon become brown and dry and are usually surrounded by a yellow halo. When many lesions grow together, large areas of dead leaf tissue may develop. The halo is actually caused by a toxin that is produced by the bacteria within the lesion. As the toxin diffuses out into the leaf tissue it causes a breakdown of chlorophyll and creates the halo. 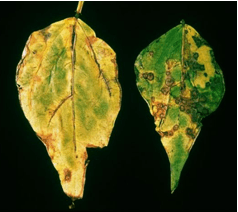 When toxin from infected leaves is transmitted to the growing point of the shoot, the new leaves that develop are often stunted and chlorotic. Developing seed may rot or become shivelled and discoloured. Cajanus cajan, Lablab purpureus, Macroptilium spp., M. atropurpureum, Phaseolus coccineus, P. lunatus, P.vulgaris, Pueraria spp., Vigna angularis, V. radiata, Neonotonia wightii, Centrosema pubescens. The bacteria have a worldwide distribution. They are found in regions of latin American which have moderate temperatures such as the southern Andes zones of Peru and Colombia, in southern Chile and Brazil, and in the Great Lakes Region of Africa, eastern Africa, including Malawi, Kenya, Zambia, and occasionally Uganda. Cells of the pathogen are single, straight rods and move by multitrichous polar flagellar. They are Gram-negative and strictly aerobic. The optimal growth temperature is 20-23oC and on agar the bacterium produces white to cream coloured colonies that exhibit a bluish tinge and often a green fluorescent pigment. P. syringae pv. phaseolicola survives in infected seeds and plant residues on the soil surface. The organism survives in these habitats until environmental conditions are favourable for infection. Isolates of the pathovar are categorized into three races on the basis of the reactions of a range of differential bean cultivars. Seed transmission is higher when infection occurs earlier in plant development. P. syringae pv. phaseolicola multiplies rapidly on or near the surface of foliage with or without lesion in the presence of des. It is disseminated between leaves and plants by water splash and wind during periods of rainfall. Agar plate dilution technique. King B semiselective culture medium and serology with commercial kit. The best method of control is the use of disease-free seed produced under conditions unfavorable to the organism. Contaminated seed also can be treated with chemicals or antibiotics to destroy bacteria present on the surface. Chemical treatment is seldom effective against internally borne bacteria. Halo blight has been controlled chemically with Bordeaux mixture, copper oxychloride, copper sulfate, copper oxide, streptomycin sulfate, and dihydrostreptomycin sulfate. Buruchara RA, Pastor–Corrales MA. 1981. Variation, virulence of Pseudomonas syringae pv. phaseolicola on beans in Colombia. In Lozano JC, editor. Proceedings of Fifth International Conference on Plant Pathogenic Bacteria, August 16-23, 1981, at CIAT, Cali Colombia, pp. 341-351. Frison EA, Bos L, Hamilton RI, Mathur SB, Taylor JD, editors. 1990. FAO/IBPGR Technical Guidelines for the Safe Movement of Legume Germplasm. Food and Agriculture Organization of the United Nations, Rome / International Board for Plant Genetic Resources, Rome. Legard DE, Schwartz HF. 1987. Sources and management of Pseudomonas syringae pv. phaseolicola and Pseudomonas syringae pv. syringae epiphytes on dry beans in Colorado. Phytopathology 77(11):1503-1509. Taylor JD. 1970. The quantitative estimation of the infection of bean seed with Pseudomonas phaseolicola (Burkh.) Dowson. Ann appl. Biol. 66:29-36. Taylor JD, Teverson DM, Allen DJ, Pastor-Corrales MA. 1996. Identification and origin of races of Pseudomonas syringae pv. phaseolicola from Africa and other bean growing areas. Plant Pathology 45:469-478. Schwartz HF. 1989. Halo blight In: Schwartz HF, Pastor-Corrales, MA. Bean Production Problems in the tropics. CIAT. Cali, Colombia, pp 285-302. Pastures of this legume are often severely affected in Colombia, with up to 50% decrease in dry-matter yield. Seed production is also reduced. Under humid conditions, pods and seed rot rapidly, reducing seed production. Seed infection can be as high as 95%. The disease is characterizates by water-soaked lesions on the young plant, especially young leaves, petioles and terminals, progressing to blight, necrosis, dieback and defoliation. Necrotic spots develop on older leaves and flowering and seed production may be severely reduced. Centrosema sp. (C. acutifolium, C. pubescens, C. brasilianum, C. macrocarpum, C. schiedeanum and C. virginianum), Allium, Brassica, Phaseolus sp., Solanum spp., Leucaena leucocephala, Leucaena esculenta, L. pulverulenta, L. diversifolia and L. shannoni. Belize, Brazil, Colombia, Guatemala, Mexico and Panama. Although the species is normally considered to be a saprophyte, Biotipe II causes root rots and leaf blights on a range of hosts, including legumes. It is distinguished from other fluorescent pseudomonas by the following characteristic: more than one polar flagellum, no poyocyanin or carotenoid pigments produced, no growth at 41°C, gelatin hydrolysed but not starch, and utilization of a wide range of carbon sources. Disease is favoured by high relative humidity and moderately high temperatures. The bacterium can survive unfavourable periods on affected plants and soil for as long as six weeks. The bacterium is seed-borne and levels of infections as high as 32% have been found in seed lots of C. acutifolium. Agar plate dilution technique. King B semiselective culture medium. Arias B, Lenne JM. 1988. Sistemas de produccion de Pasturas Tropicales de semillas de Centrosema acutifolium y efecto de bacterioocidas en la incidencia de Pseudomonas fluorescens Biotipo II. Pasturas Tropicales Vol. 10:11-18. Bradbury JF. 1986. Guide to plant pathogenic Bacteria, CAB Interantional, Wallingford, UK. Guevara Gómez CL, Lenné JM, Torres GC. 1983. Etiology of dieback of Centrosema spp. and effect of the pathogen on yield and quality during the period of establishment of the legume. Phytopathology 73:122. Lenne JM, Torres GC, Victoria JI. 1981. Bacterial leaf spot and dieback of Centrosema spp. Proceedings of the Fifth International Conference on Plant Pathogenic Bacteria. Cali, Colombia, pp. 35-38. Following the first report of its occurrence in 1920, C. flaccumfaciens pv. 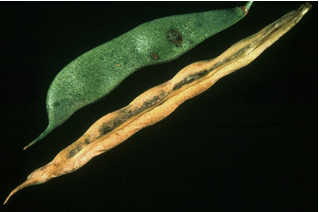 flaccumfaciens became one of the most important bacterial diseases of beans in the USA, resulting in almost total crop losses in some years. More recently, however, it has become very much less important and has indeed not been reported on beans since the early 1970s (Hall, 1991). 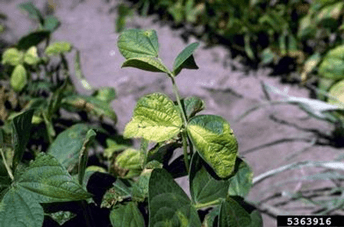 In soyabeans the disease was not reported in the USA until 1975 and is of rather minor importance (Sinclair & Backman, 1989). In the EPPO region, it is important on beans in Turkey, but causes only minor losses in other countries. Seedlings are stunted, wilted and usually die. In some plants the affected parts are dull green in colour and sometimes the stems break. Infected pods show discolored sutures and may show yellowish areas. Foliar interveinal choruses and necrosis. When the lower stem and root are cut longitudinally and observed, the vascular system is often discolored brown to black. The younger the plant becomes infected, the more severe the damage to the plant. Seedlings are frequently severely stunted or killed. If plants survive to maturity, seeds may show yellow or purple discoloration. Lablab purpureus, Phaseolus coccineus, Phaseolus lunatus, Phaseolus vulgaris, Vigna angularis, Vigna unguiculata, Zornia spp. and possibly Glycine max, Lupinus polyphyllus, Vigna cylindrica, V. sesquipedalis, Dolichos labllab, Phaseolus radiatus, P. lathyroides, P. calcaratus, and P. acutifolius. All members of Leguminosae. Curtobacterium flaccumfasciens pv. flaccumfaciens exhibits the following characteristics: cells are slightly curved rods with some straight and some wedge-shaped. The bacterium is gram-positive, strictly aerobic, and motile by one, or rarely two or three, polar or subpolar flagella, seed is transmitted externally or internally in Phaseolus vulgaris and possibly in Glycine max. The bacterium can be transmitted both within and on the seed; it is very resistant to drying and can remain viable for up to 24 years in seed stored in the laboratory. In the field it has been known to survive in soil for at least two winters between bean crops rotated with wheat. There are no reports of vectors, but the nematode Meloidogyne incognita may assist entry by providing wounds. C. flaccumfaciens pv. flaccumfaciens can infect in the absence of rain; it has not been observed to enter via stomata. Once within the plant, the bacterium colonizes the vascular tissue. Agar plate dilution technique. NBY (Nutrient Broth Yeast extract) semiselective culture medium and serology with commercial kit. Control may be effected by using disease-free seed and crop rotations. Seed grown in dry climates is usually free from infection and is, therefore, recommended for distribution. Some tolerant, but no immune, cultivars have been found. OEPP/EPPO (1982) Data sheets on quarantine organisms No. 48, Corynebacterium flaccumfaciens. Bulletin OEPP/EPPO Bulletin 12(1). Hedges F. 1926. Bacterial wilt of beans (Bacterium flaccumfaciens Hedges), including comparisons with Bacterium phaseoli. Phytopathology 16:1-22. Torres GC, Lenne JM, Victoria JI. Bacterial wilt of Zornia spp. caused by Corynebacterium flaccumfaciens. Conference paper Proceedings of the Fifth International Conference on Plant Pathogenic Bacteria. 1982 pp. 74-79.